The Edmonton Humane Society is searching for a family to take in all three brothers, who are bonded with each other. EDMONTON, AB (October 9, 2018) – The Edmonton Humane Society (EHS) is facing a giant adoption challenge – literally. 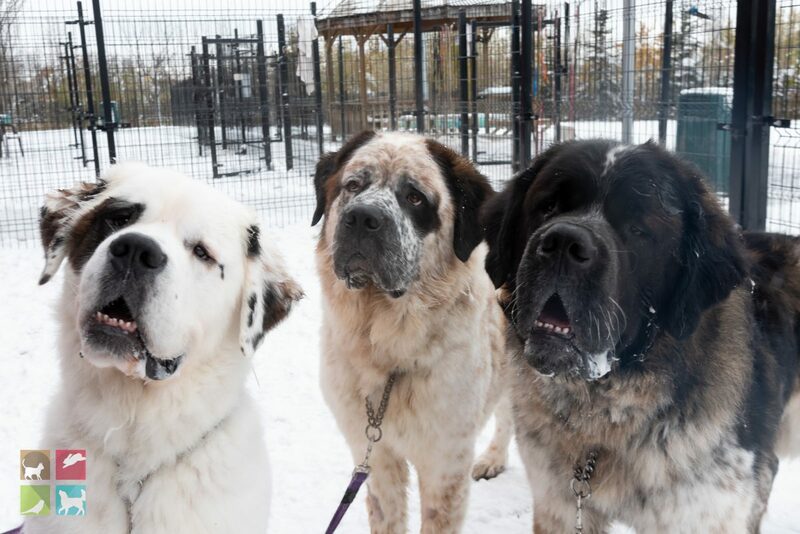 Three adult Saint Bernard dogs are looking for their forever home and must be adopted all together. Goliath, Gunther and Gasket were transferred in to EHS’ care from another animal welfare agency. The dogs are estimated to be approximately two years old. While friendly and playful, their behaviour assessment showed signs of the trio being bonded with each other, including high levels of anxiety, searching, and attempting to escape in order to find each other when separated. As a result, EHS is requiring that they go to the same home. “We also wanted to ensure their welfare and given the outcome of their assessment, we could not put them through the stress of being separated,” she added. The dogs arrived underweight but are otherwise healthy. All three of them weigh over 52.5 kilograms (115 pounds). They have recently undergone their neuter surgeries, and will be available for adoption as of Wednesday, October 10. EHS is recommending that interested adopters seriously consider the significant expense of adopting three giant-breed dogs before making the commitment. Their food alone is estimated to cost over $300 a month. The life expectancy of a Saint Bernard is 8-10 years, and potential veterinary expenses must be considered as well. Because of their large size, EHS is recommending they go to a home with older or no children and with a large outdoor area. The dogs appear to be house trained and get along with other dogs. City of Edmonton by-law only permits up to three dogs per residence. To provide them with ample space during their stay at EHS, the dogs are being kept out of the shelter’s public viewing area. Interested adopters must email adoptions@edmontonhumanesociety.com to schedule an appointment to meet them, and will be required to go through an adoption interview which includes questions about lifestyle, family activities, and daily schedule to ensure the family can fulfill the lifelong needs of the dogs. All family members are also required to be present. To view all of the Edmonton Humane Society’s adoptable pets, click here.